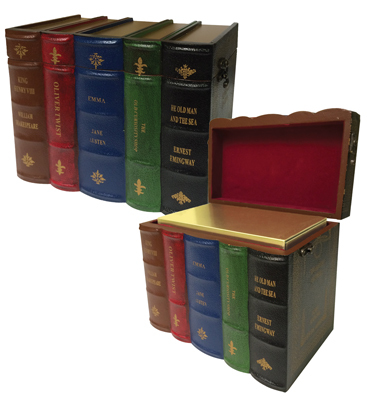 For the family who wants to conceal an urn on a bookshelf, the Classic Book Urn is the perfect choice. The urn is made from MDF wood and inside is a sheet bronze urn, protecting the cremains forever. The sheet bronze urn can be engraved as well. The Lord's Prayer Bible Urn is a ceramic book-style urn with ivory mother of pearl finish and antique guided page edges. Reminiscent of a old family bible. The Bible Book Walnut Urn is a beautiful handmade urn of walnut and red oak, made in the USA. This adult urn is also a podium for a bible or other precious book. We do not include the bible, but we do include a tassel in your choice of Blue or Burgundy. Measures 9 1/2" x 12 1/2" x 7 1/2"
This bracket-style mantel clock features a high-gloss Oak Yorkshire finish with a hinged door to an interior compartment, which can conceal an urn. Decorative dial with antique brass finished accents, glass crystal, Roman numerals and a quartz battery-operated movement. Includes a mail-in card for a free engraved personalization plate. 14" H., 10.25" W., 6.5" D., 200 c. i.